As our current class of tour guide “trainees” finishes up their 6 months of training in order to begin providing guided tours to museum visitors, we’re gearing up for another session of the training course. 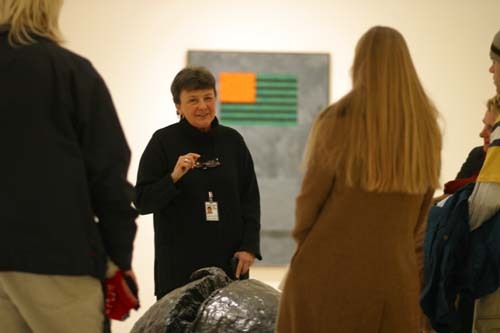 If you’re interested in contemporary art, enjoy being around and talking to others who share your interest, have teaching or public speaking experience, and would like to dedicate your time to guiding visitors through Walker exhibitions, please consider joining us as a volunteer tour guide. Benefits include curator-led tours of Walker exhibitions, training in modern and contemporary art history, catalogues for exhibitions you tour, discounts on many Walker events, and opportunities to further your own education in the arts. If you’ve been reading these posts you also know that we offer additional opportunities for guides to further their knowledge of the arts, as well as build a community of other individuals interested in contemporary art and what’s going on in the local, national, and international art scene. For more information on this opportunity, or to receive an application, email tours@walkerart.org or call 612.375.7574.